I've been an AMA member for quite a few years and have done LAB2V twice. My first time was 2011 on the GSA and I basically destroyed my rims (20 psi was too low obviously). I did it again in 2015 on the 990 and it was much more fun given I could actually ride better and had a more dirt-appropriate bike. I followed @motoguru and his buddy on small bikes and we finished quite early on day 1. Day 2 we split up but it was still a lot of fast fun tracks. Me in 2011. Such the Starbucks noob in my BMW whale foreskin suit and Schuberth C3 touring helmet! 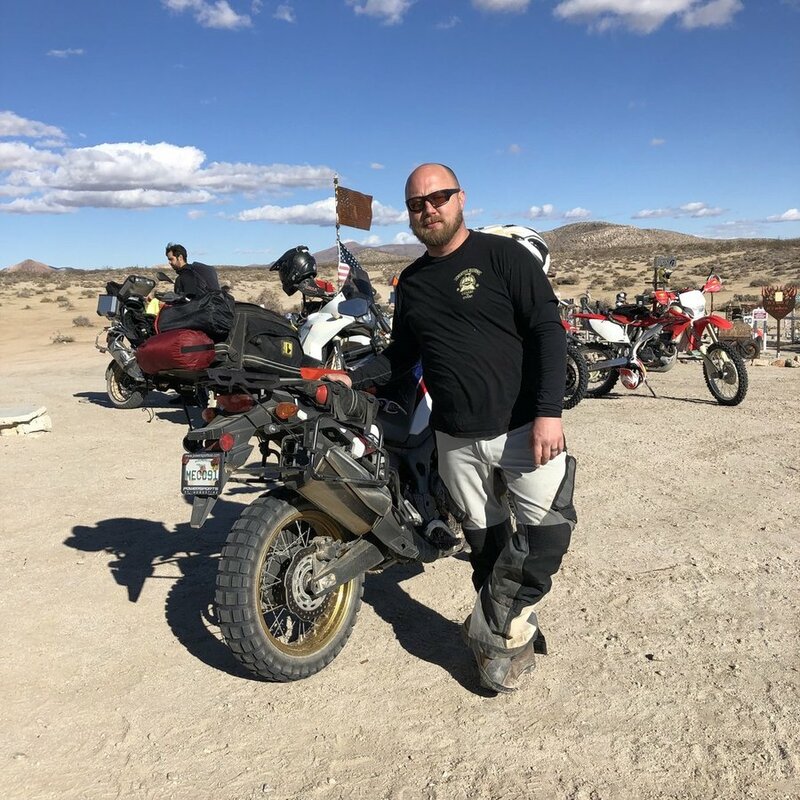 I think there were about 60 adventure bikes this most recent event and unfortunately I know of at least a few who had some unfortunate spills with injury like @William Howard and Evan Brown. I met the AMA D37 director, Kieth Huff, that year in 2011 as well and he's been trying with some degree of success to build a better ADV showing each year. 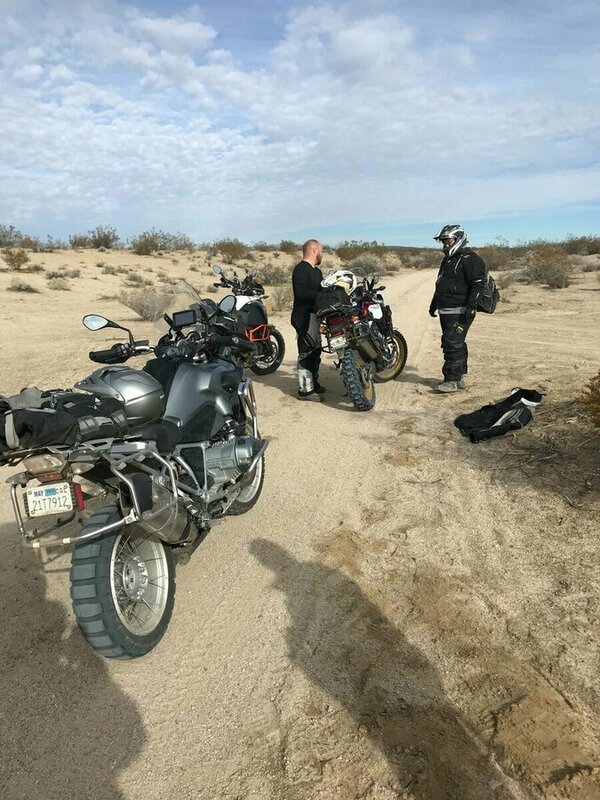 He's asked for help putting together a route before and I did give it some consideration but I was concerned the BLM was just going to say "no" and force us down the same power line roads they always go; roads I'd never choose to ride on a weekend fun ride let alone an adv-appropriate trail. But this time Kieth says don't assume that's the case; that this event brings in quite a lot of fees to BLM and they've actually been very cooperative. He's confident they'll work with us and may even prefer the more road-friendly motorcycles on the more tame roads out there. So LAB2V has been historically quite the experience, for small bikes and especially for adv bikes. But that's also meant not many can ride it on an ADV bike without a considerable risk to injury or damaging their bike. Whoops and deep fluffy sand aren't really the type of terrain that's going to provide a safe and enjoyable experience for the average ADV rider. "But Eric, THAT'S THE DESERT!" many crusty old dirtbikers will say. "SACRILEGE!" they'll say at the idea of creating "some kind of Starbucks poser route!" Exactly!!! This really strikes at the core of what XLADV is all about from the beginning. Our motto is "size matters." It does! Bigger adv bikes are made for different purposes. They're made with stiffer rear subframes to carry gear, bigger tanks for longer range and more power and wind protection for long distance comfort on the highway. They don't handle the same way as a dirtbike and aren't designed for the same terrain/riding style. This is apples/oranges to compare big with small and somehow say "big bikes don't belong." Bent my paralever strut in to where it was rubbing on the tire. Found some ATV people camped with their RV who loaned me a pipe to bend it back out. I think this is a great opportunity for the AMA D37 to expand further in to ADV. After all, it's the American MOTORCYCLE Association, not the American Dirtbike Association. I'm sure there will be much blowback and wailing as well as "Starbucks" jokes thrown out there but I'm actually counting on that! I'd love to leverage this in a number of ways. I'm sure we can get sponsors and volunteers to set up "Starbucks bistros" along the way for photo ops that are then leveraged on social media (Instagram, Facebook) for points. Prizes will be awarded the final night for those with the most points. I'm sure many sponsors will have an interest here and perhaps each coffee station could be sponsored/manned by a particular company who'd LOVE the opportunity to also display their wares under their EZ-UP. With over 100 riders posting snapshots of each coffee station (and sponsor) online I'm sure they'd be more than willing. You'd need a selfie of you holding a Starbucks cup with the sponsor's sign behind you. Managed to limp to the finish via highway from Baker stopping a few times to add air to the front wheel. 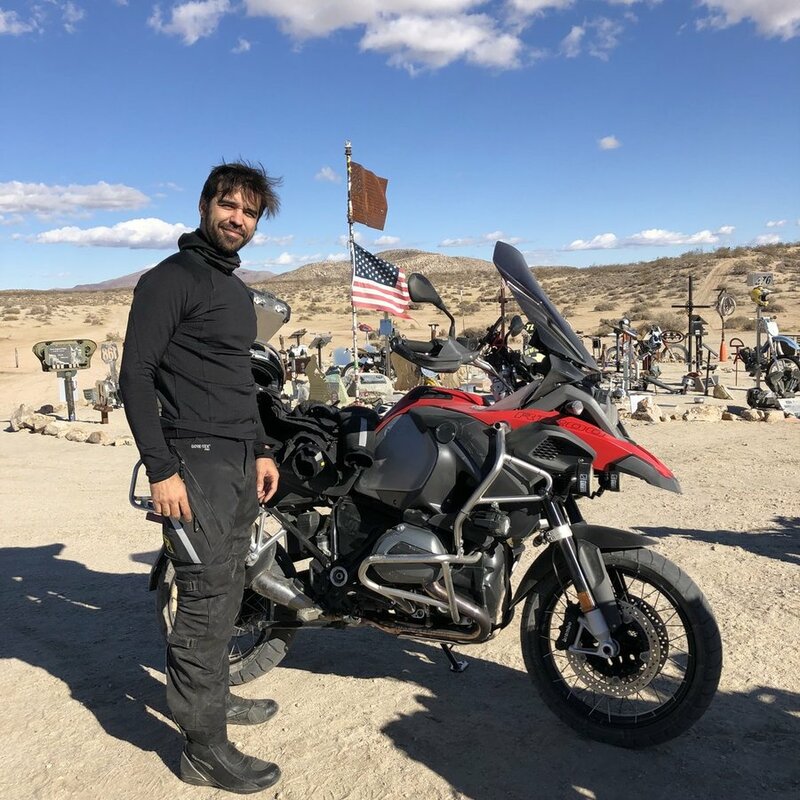 I'm aiming for a truly tame course that the average rider on a GS could do with minimal "difficult" sections, no more than 10% of the total miles even. Like the stretch between Husky monument and Inscription Canyon can be sandy (depending on time of year) but not impossible. The route would be even a bit easier than the BDR-style Beyond Starbucks Gold route I came up with. That would be a good practice run for those wishing to get some practice in. I will be scouting routes with Mike Neagle who does the dual sport and hard routes for LAB2V in the next few months. He's out of town this weekend but I'm going to do some scouting myself this Sunday if anyone would care to join? Meet at 8:00 am at the Starbucks (of course) in Adelanto on Hwy 395. Mike Neagle here AKA as No Limit Dual Sport. 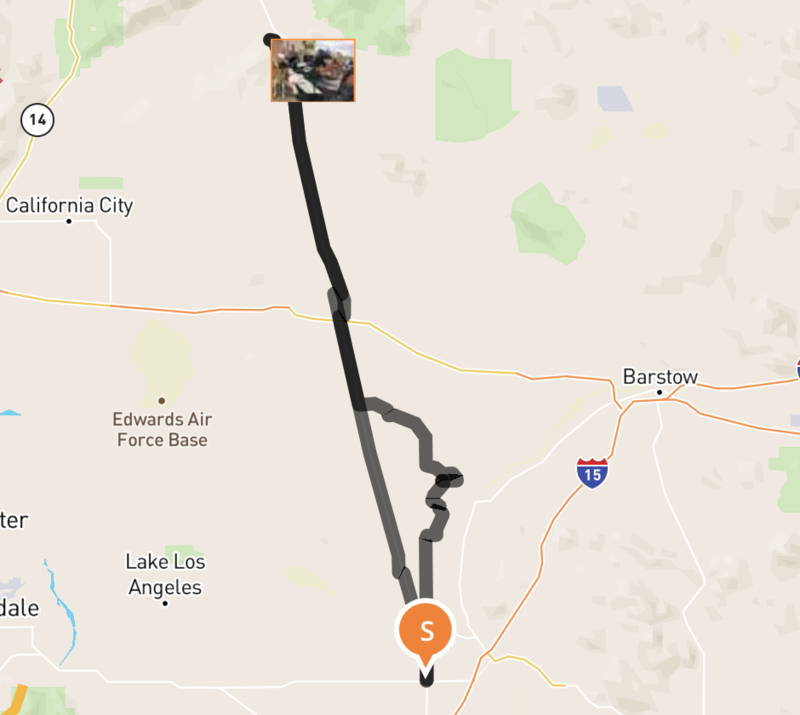 I think we could layout a route pretty quickly as I know the area quite well. I am not sure how the permitting will work they do have a rider cap count approx. 550. I have worked with the D37 group for numerous years and I have worked on the routes (ribbioning, proofing, etc) since 2011. I have several options in mind already for a proposed route, however, some of this will be dependant of the actual LABToV course so it could correspond with checkpoints, lunch, etc. I would think. Just watched your Intagram Live (ok, late so recorded). Great idea Eric. I think in true ADV style a "camp out" instead of the traditional Hotel / Motel in Barstow might be fun (and probably cold). Great idea about the coffee stands too. Think you could get Starbucks on board, or are they pissed about your Beyond Starbucks logo? Per Mike Neagle's comment, did they it they max out the 550 this year? It's great to be working with Eric again. I hope to grow this segment of participants. The latest MIC numbers show the ADV bikes are leading all sales of motorcycles. The AMA D-37 Committee was showing signs of wear when accommodating the big bikes. There were a lot of reasons, some of them being the size, the amount of resources required when one needed assistance as well as different skill levels. A beginner can ride b2v on a Honda 250 and have a blast. A beginner on a GS is gonna have issues on the route this year. A guy like Gerd or Big Todd and Eric can ride them and aren't afraid to bend a rim. Not all Adv riders are at this level. We want the average or even beginner to ride these bikes as they were intended. This isn't an XLADV ride a Joel event or even a Rawhyde, they all do great events and are good for the sport. LA-B-to-V is different. As Eric alluded to we are fully permitted and insured for every mile we ride. We pay dearly for that privilege and our riders benefit. We aren't going to hold your hand and babysit but we'll be there to help when you need it. This is a true Adventure, you want something to talk about at Starbucks, this is it. Eric's finally going to help us have a true dedicated ADV route for regular folks. 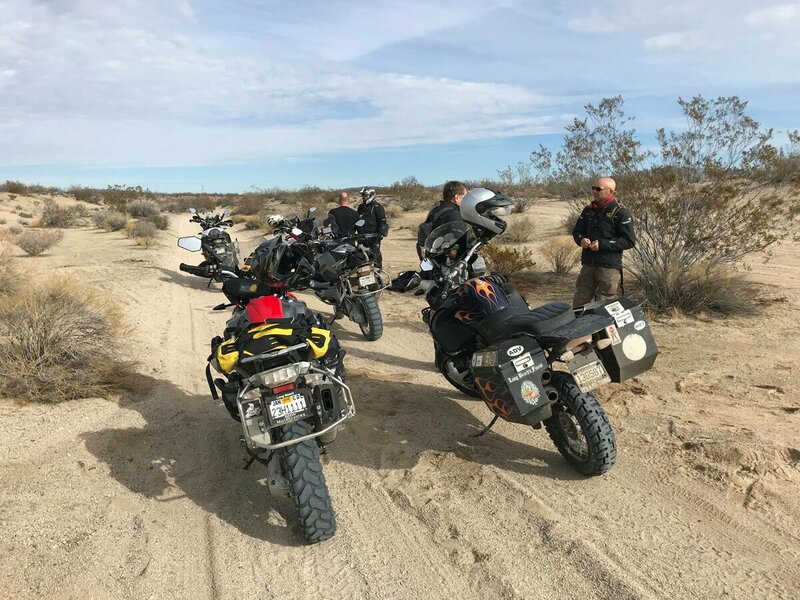 You badasses can do the Dualsport route, we aren't telling anyone which route to take or limit anyone. We all party with the Showgirls in Vegas. 500 riders, 500 miles, 500 stories.....just get there baby! Thanks, @Kieth Huff and @No Limit Dual Sport for this opportunity. Really looking forward to offering simply a fun time on an adventure bike people won't forget. We'll do it safely and with respect to our environment so BLM and everyone are happy. We'll be talking more soon and I'm sure I will learn much more about how to execute this successfully. You have many many years of experience with this! Had a great day of riding today with Nicholas Blewett and Ethan Demir. We busted Ethan's dirt cherry too! He showed up on his sparkle pony where else but Starbucks! He has his bike extra clean complete with shiny aluminum panniers (which we left in Nicholas's truck) and his Klim Badlands suit (made from real whale foreskin). It was a chilly morning with temps at Starbucks about 42. Had to crank up the heated jacket to 11! We got on the trail and Ethan was doing alright but for two minor falls. Later he had a more serious fall when he went to put a foot down but it was the downhill foot and there was nothing to touch so he fell hard and bruised his right hip but seems to be okay. He handled the rest of the day pretty well, all things considered. So I hear this low familiar braap over the hill and guess who rides up to a brake slide stop? Jordan Huibregtse, the KTM Challenge winner who KTM gave a 790 Adventure to to play around with. He was in town still from last week's LAB2V and I think he wanted to show his dad the Husky monument. Super nice guy and great rider. So bottom line is that we had a blast! Having Ethan there as a noob guinea pig was perfect. He got through everything fine with just a few minor tip overs and did the whole course if but at a bit slower pace than most. Most importantly, he had a great time! @Eric Hall I'm really excited for this route to happen. There have been a couple years where I contemplated doing it but was always concerned my bike wouldn't make it out the other end. This is a big deal since my bike is also my form of transportation to get to work. Will be watching the developments closely. The Backcountry Discovery routes are no different. Tens of thousands now have ridden dirt routes over tens of States with minimal mayhem. Turns out people can ride adv bikes off road after all. Would love to help if I can get free time. Any major waypoints the route needs to hit? Was not able to make the ride this weekend. My son had a volleyball tournament that I thought was Sat so I scheduled the ride for Sunday. Then I find out late that the tournament is actually Sunday so I had to bail but I think 4-5 still showed. It was Nich, @Trailzrider, @Bip Schkaboden, Rick Giroux and Drew. I heard that long straight road north was sprayed down with what smelled like sewage. I heard there were a lot of deep puddles from the rain and then a rock field over by Inscription Canyon but not too bad. I got the opportunity to go to the AMA D37 meeting last night with all the LAB2V committee there and it was really something! Met a lot of great people who've been there since the event started (35 years)! I already knew three of them and saw a few other familiar faces. The agenda was basically going over what worked well and what didn't from the most recent event. The topic of big bikes came up and it triggered quite the discussion! I'm pleased to say though that they are extremely excited about offering an adventure bike route and very welcoming of "our kind." We did address the pushback some have voiced but they were clear that the AMA D37 welcomes adventure bike riders. 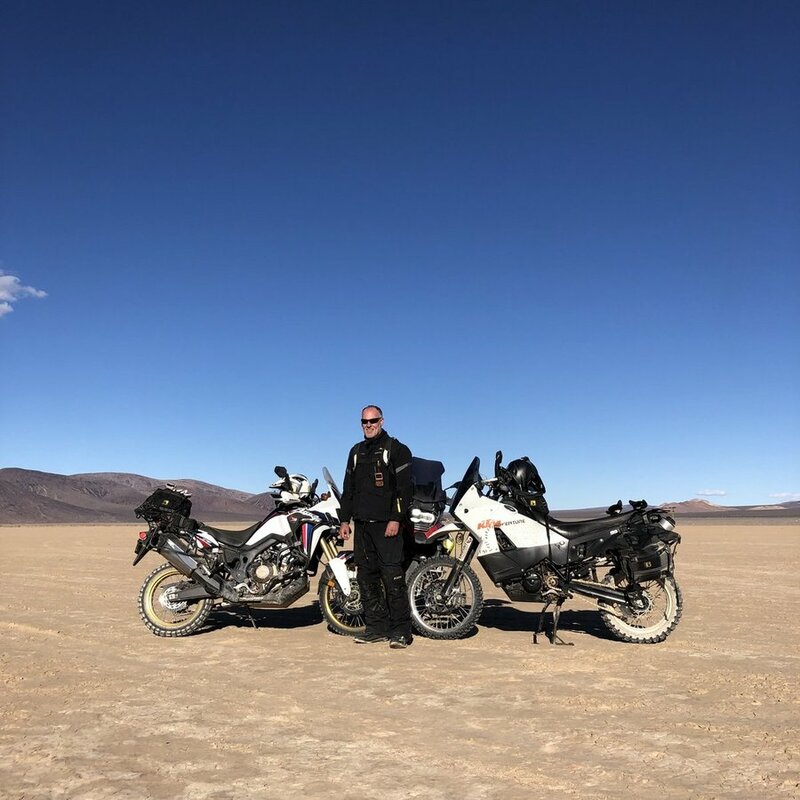 What was really cool was a few of the old timers told stories of basically "when I first did the route in '84 I was on a 650L and had no idea what I was doing! The sweep was pushing me all day and I went out there with no tubes, no pump, etc..."
The point was that we all start somewhere and that this event has always been a significant milestone and accomplishment for many people in their riding careers. That being said, I'm going to be spending a lot of time talking about preparation for this event for the average rider. I'll talk about practice, training, bike prep and what the big bike rider can expect. This isn't going to be a "Starbucks" ride either. 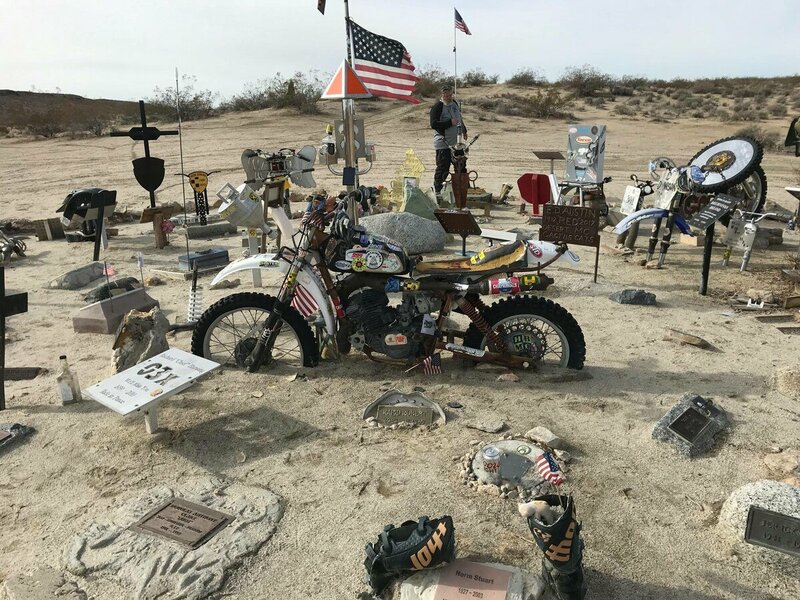 It's the Mojave desert and even something we create for the big bikes is going to have its own series of challenges. I haven't ridden the southern portion of the CA BDR yet but I'm told it's actually quite challenging. This route will be similar I'm sure. When you get some assemblance of a route, let's test it out some weekend. I rode with Ethan the noob again yesterday. He got some Motoz Tractionator Adventure tires and some good boots (SIDI) and had a good time. He did fall twice but it was really deep sand and he's still learning. He did much better than I did my second time off road. I live in vegas and know the area between Baker and Vegas like the back of my hand. Would like to help in anyway including bike storage and lodging at my home for when it’s time to proof the last sections coming into Vegas. @William Howard posted this up on Facebook and I'm copying it here because well... you know Facebook. 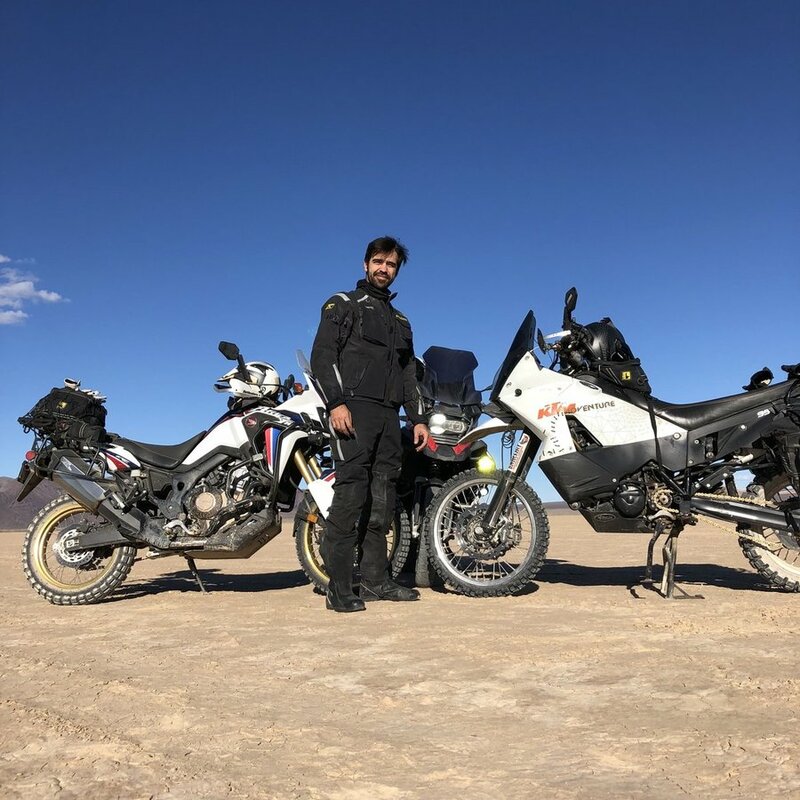 In a day it will be essentially gone and difficult to find ever again but it does demonstrate how challenging this ride can be on a small bike, let alone a big adventure bike like his GS. I've ridden with him before and he's a fine rider. Definitely no noob. Hopefully next year we'll have a more adv-appropriate route from this scouting we're doing. I have been asked to share my experience at LAB2V this year. As many of you know, I had an injury on day one and spent five days in the hospital with multiple broken ribs and a collapsed lung from a low speed crash on single track. I wrote this on the morning that I was released from the hospital. It is Wednesday, November 28, 2018. I decided to write this now as I am reclining in a comfortable chair on the 6th floor as I look put at a clear southern sky. A 5/8 inch diameter clear flexible tube is coming out of the left side of my chest which drains into a plastic box filled with blood and plasma. It's the first day I could get out of my hospital bed and feel somewhat normal again after a harrowing experience on the first day of the 2 day event. 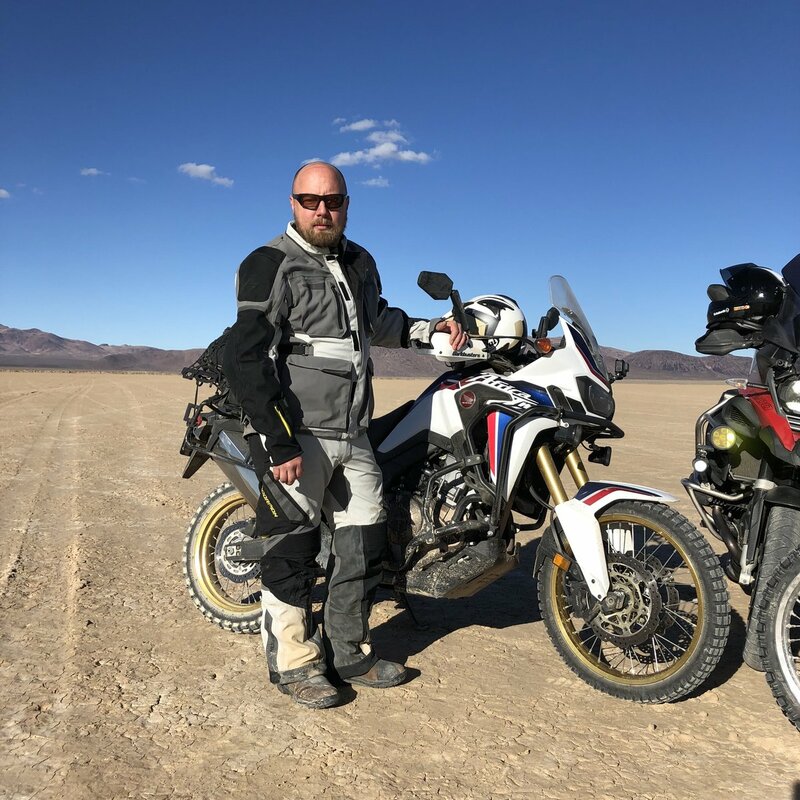 Preparing for the event, I spent months in the gym, waking at 4 am to begin my day, and hundreds of miles of moutain biking to train my body to ride hard for two days on my 2011 BMW R1200GS. The choice to ride my adventure bike would, in my mind, be an odd and ambitions aspect of the ride. I knew that I would experience some challenging terrain so I also tuned and modified my heavy bike accordingly as well, lightening it up as much as I could. I started the day with a touch of bronchitis but was determined to complete the event anyway and remind myself to ride conservatively, drink and eat regularly as I had done in the past in the Adventure Races and Ironman Triathlons, in which I had competed. I had a good friend joining me and I knew that I could count on him to help out if I needed. The morning arrived and after the registration process we were on our way. Navigating for the first time with the roll chart was fun, and so was using our communication devices together. We rode along the asphalt with another 5 or 6 guys all headed to the start of the dirt. At one point I realized I was hearing a tapping on the helmet and realized that in my excitement, I had forgotten to fasten my helmet strap. Finally after around 15 miles, there it was. A dusty line on the horizon directed us to the first right turn into the dirt. I followed and made the turn at the back of the group, and I could feel the excitement. The adrenaline was really flowing on easy terrain and I had to calm myself down. It's going to be along day...A long two days, so take it easy. It was dusty and guys wanted to get by my big bike, and I let them when I could. I could hear them and respected the situation of the lighter more nimble bikes moving more easily over the ground, versus my heavy bike sinking and bouncing more. The trail required attention to find a good line, there were ruts, drop offs, hard sections where the trail would split, and made more difficult by the dust. 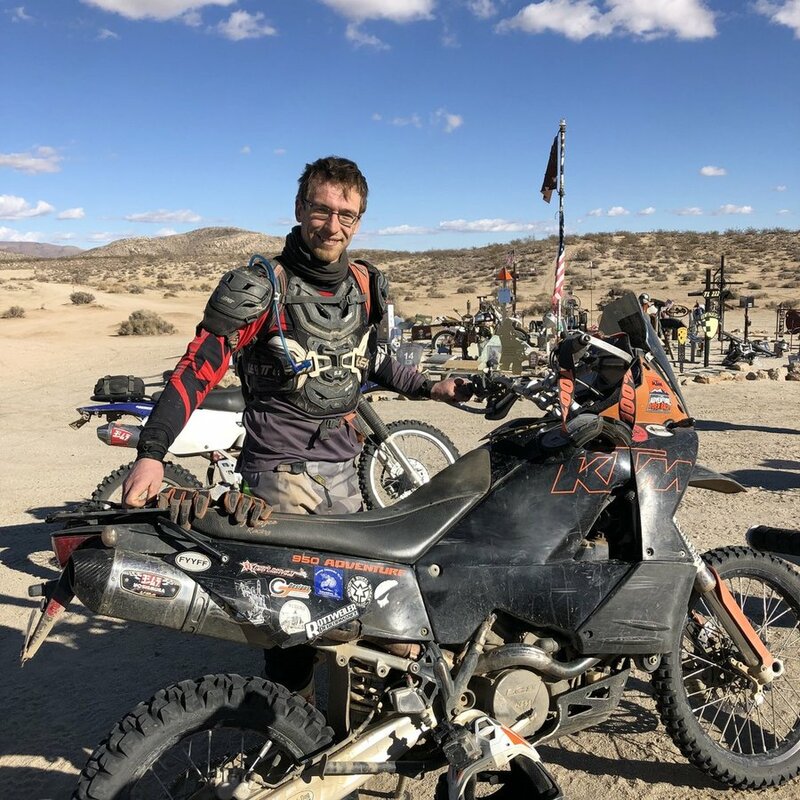 I think the moment I knew that this was going to be a serious and difficult ride was when I saw and climbed a short, around 200 foot climb over rutted, and rocky, single track, which small bikes were dropping. I made it using all the skills I have and could feel that adrenaline again. I was elated and a nervous about the trail ahead. For most of the day, my riding friend would call out the hard terrain ahead until after lunch my battery died in my headset. The r were time on the ride when I could move fast and though we would get through the course before dark. Other times, the going was painfully slow over baseball size rocks and deep gravel sections. Thinking back, the most memorable portion of the ride, for sure, were the two, very steep hills, which were rocky, shale, loose and exposed. Slowly over the crest of the midday trail, I down shifted to first gear and saw it. A clifflime view, of a blue and white motorcycle, on its side and it's rider on the ground. For just a microsecond I felt like I was atop a black diamond ski slope and my immediate reaction was to look right and left for the alternate route down the treacherous grade. This was it. I WAS going to ride down this. Before fear could overcome me I moved forward onto the best line I could see, which cut left sliding my bike sideways and it slid onto the soft grade and set down on the hillside on the left side of the bike. My partner was watching me from below and asked ifzi needed help. That would be a long walk for him, so I said I would try to work it put myself. I waited for the other rider to get going then I turned the bike and mounted it slowly and went. At one ,moment my balance went over the opposite side of the bike and almost tumbled sideways, this was dangerous. Carefully applying hard front and rear brake, with the clutch, I found the right line. At the bottom of this hill, leveled and began another grade of loose rock. The best line down the wide hill was hard left along the ridge which was exposed. I would either drop the bike or fall off the edge. I surfed this line and let the brakes go close to the bottom to avoid more sliding. I met my partner, caught my breath. My forearms were pumped, and my shoulders were tight, and we still had a long way to go. We moved along quickly to stay on pace and onto a single track, my partner leading, I was outside myself. For a moment the terrain under my wheels seemed alien, but I was moving well, on instinct. Between this section of the trail, and the section where I came off the bike, I don't remember too much. 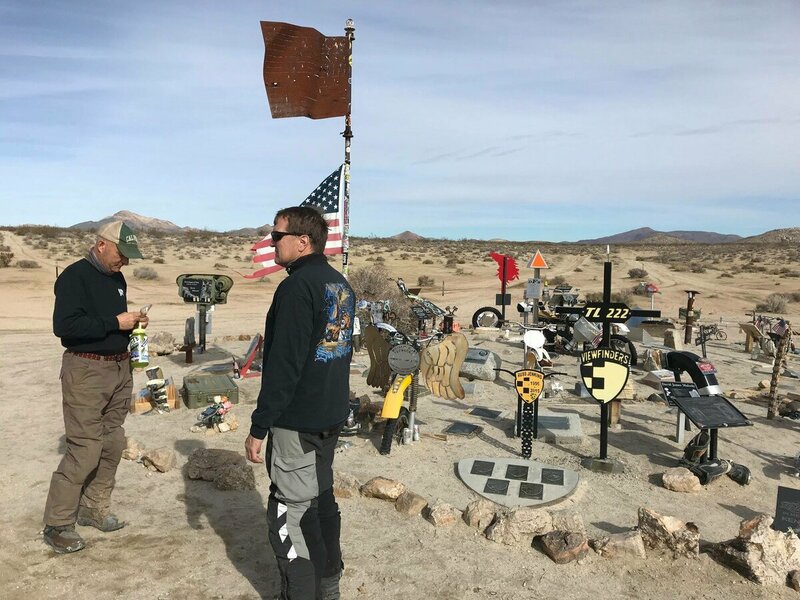 I do know that it was getting late in the day and the shadows were getting long and the fun feeling on the trail turned to urgency to move quickly and race the sun to Barstow. It was single track, twisting, ruts and softball size stones. I needed to keep the right line and rest my mind on the easier sections. This being the first time on this route, I didn't have luxury of knowing what was ahead. On a narrow section as I veered right and stayed at the center of the single track trail, I was standing on the pegs and out of the corner of my eye I must caught the view of a dark boulder outcropping on the right side, as I passed I thought, that will be close, as I did not have enought time to react, but I thought I would clear it. With a violent jerking motion, I was thrown left landing onto my left side chest, hard. I knew something had happened as I had trouble lifting myself and getting the bike up. I sat there. I was not out breath, but wished that's all that it was. I told my partner that I was hurt and that it I think it might be serious. But the truth is, there was really nothing else to do but try to keep moving. Medical attention was likely hours away and would arrive after dark anyway so we still has the challenge of finishing the day before dark as it was now close to 4 pm and was almost dusk. I asked my partner to get 4 advil from my first aid kit. 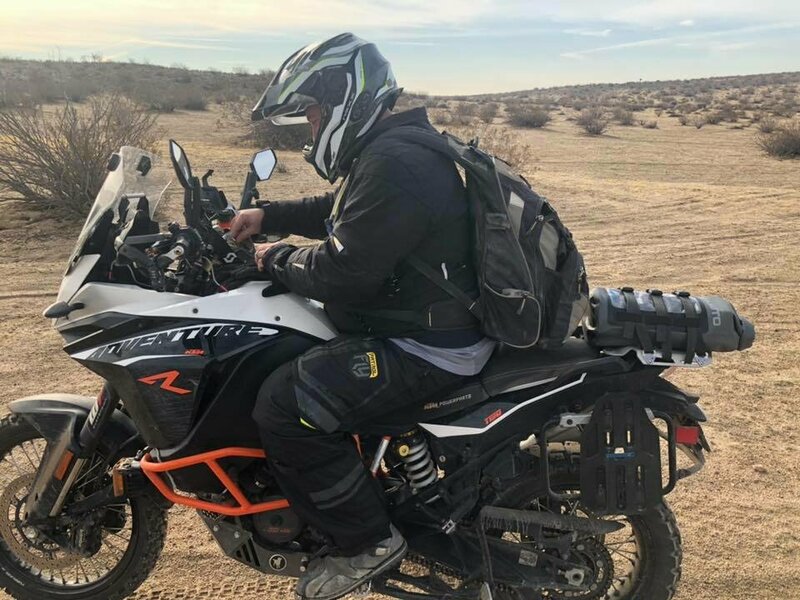 Immediately, after remounting the bike, I immediately encountered hard pack trail, with softball sized boulders which were painful and challenging, and I began to realize my injuries. So it was getting dark, I was sweating in my helmet, in tremendous pain, having trouble breathing and all of my lights were out from the crash. I asked my partner a few times how many more miles we had to complete the route and he said 35. I insisted that we keep moving as fast as we could as I was having trouble seeing the trail. I was also watching my too other to try to get a sense of how fast we were moving and when we would finish. For the first time, I could see the lights of civilization, in the form of flashing red and blue lights of three emergency vehicles. We passed the paramedics treating a fallen rider and I thought that my injuries might be as bad or worse than this injured man, but I was determined to keep moving and put this trail behind me, quickly. Ten miles in and things were not getting easier. With darkness upon us we encountered the deepest sand my bike has seen. It was like some kind of curse I thought. I am the most pain I've been on the bike, I have no lights, and now I'm going to have to get through this. My partner assured me there was this last mile of trail, then asphalt. 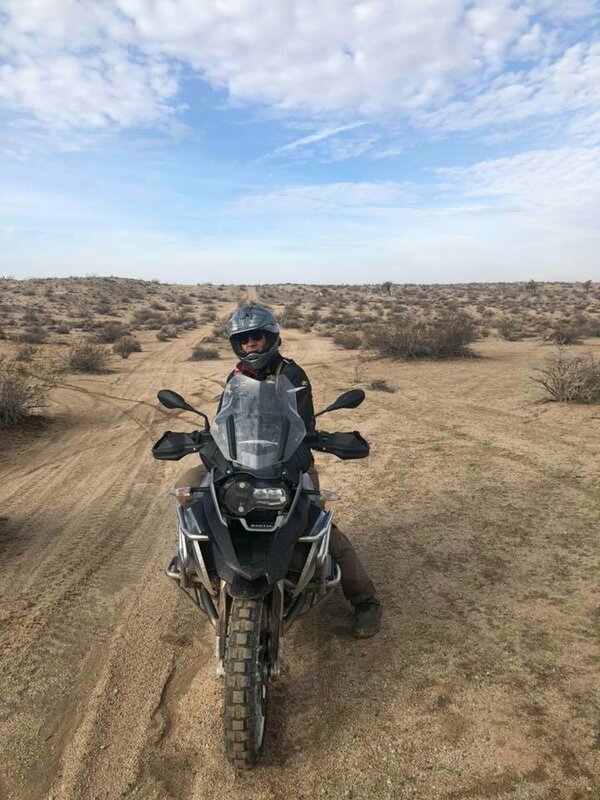 Getting through this deep sand on my adventure bike was like pushing a boat backwards through mud. 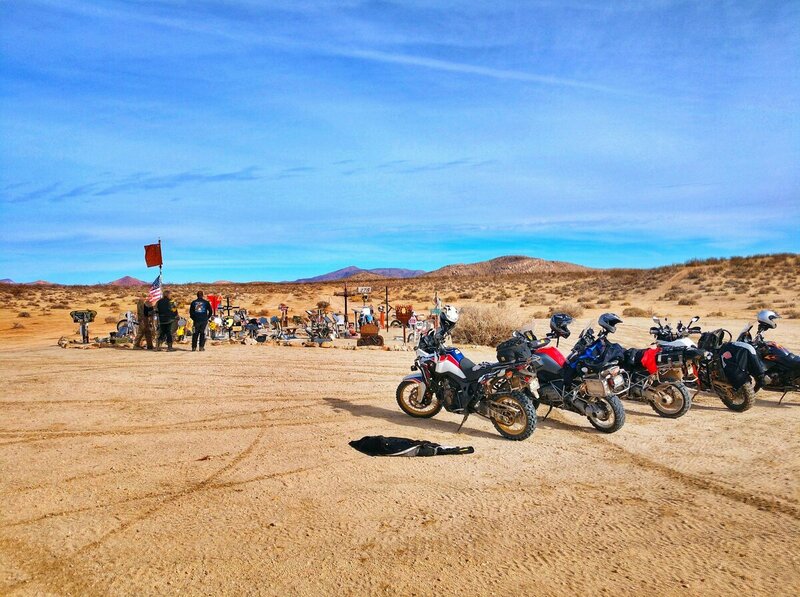 I dumped the bike several times, in the soft sand, righted the bike, remounted, and dumped it again. In too much pain to ride properly or pick up the bike properly, I was at my wits end. My partner asked to switch bikes with his smaller machine, I refused and rode out of the last section of sand, relieved to see hard ground. The dark highway was illuminated only by the headlights of the riders around me and I used my partners headlight to see. Cold and hurt, we arrived at the finish chute. My anticipated excitement was now concern. In my attempt to normalize the situation, I had beer and tacos, and picked up my riders packet for the next day, thinking maybe......I might ride tomorrow and was just a bad spill. Sleep and rest might heal all. After a sleepless night of trying to find a comfortable or even a bearable position in bed, I awoke, breathing heavily and coughing. I told my partner I wouldn't ride and he left early to get on the trail. I told him I would take the highway to Las Vegas and meet him there later. I looked around the room and saw all the gear that I needed to pack and got started. I moved slowly, unable to bend at the waist and panting, I knew something was really wrong, and I saw in the mirror my left side chest was bigger than the right side, looked swollen. I decided to a swallow my pride and ask for help, I called my partner to see if he had hit the trail, and it went to voicemail. I kept packing. It was almost impossible and I didn't know how I would be able to ride this, asphalt or not. I downgraded my ambitions and decided not to go to Vegas and instead focus on getting medical attention. I was scared now and called my wife, and had trouble speaking because of my limited breathing, also I was upset. As we were talking I coughed up some blood and told her about it. Were were both worried and I decided to go to the hospital. I knew someone would have to gather up my luggage so I made sure to take the time to pack all my bags despite the pain, I just didn't want to inconvenience anyone. 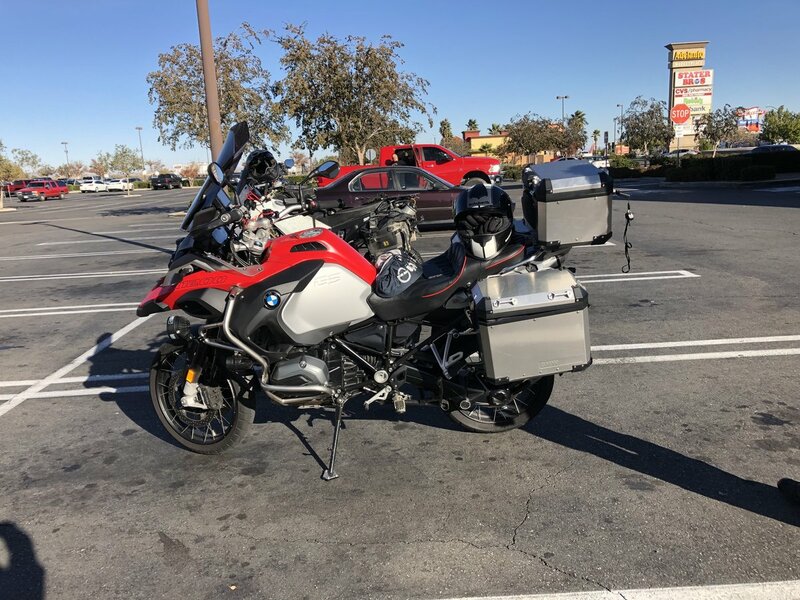 When my bags and panniers were packed, I left the motel and got a ride to the hospital from one of the ride officials (Dan) to give me a ride to Barstow hospital. In the emergency room, the xray showed that I had multiple broken ribs, and a collapsed lung. The doctor made an incision under my left chest muscle and painfully inserted a tube into my chest. I was now sweating from the pain. He gave me morphine and was my best friend now. I was transferred to another hospital. On my fifth day, I am feeling better am hoping to have the chest tube removed today, so I can go home and recover. Looking back, I think the accident occurred as a result of a laspe of concentration brought on by the bronchitis I had prior to the event. I just didn't see the risks involved and I am grateful for the help of my riding partner. 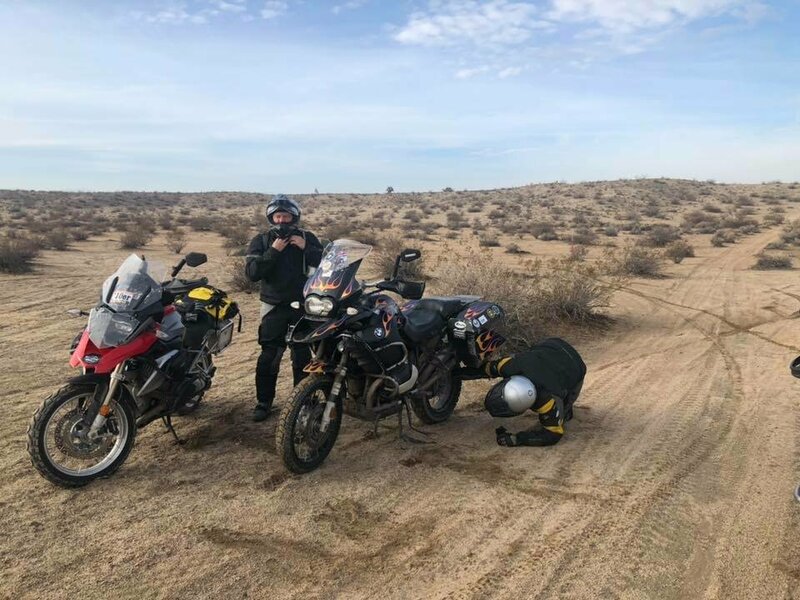 Nich pulled a total Starbucks move in that he TRUCKED his Africa Twin what like 20 miles from his house in Palmdale? LOL! I asked if I could record him putting his bike in the back of the truck and he said "sure!" I said "these videos get like 50,000 views" but I was just kind of exaggerating. Except looking today it shows we got 63,000!!! Glad you are recovering, maybe next year I will be not on call again (been 4years since I was free) and can try this again. Would love to drag some bikes out to this area and experience what you guys have to offer. Is there a time of year that's better than others? Would like to do some rides on the 1290 and maybe some difficult single track on the 500. Are there enough riders out there for a lone rider to hook up with?